Here’s part 6 of the ongoing serialization of Refactoring HTML , also available from Amazon and Safari. The separation of presentation from content is one of the fundamental design principles of HTML. Separating presentation from content allows you to serve the same text to different clients and let them decide how to format it in the way that best suits their needs. A cell phone browser doesn’t have the same capabilities as a desktop browser such as Firefox. Indeed, a browser may not display content visually at all. For instance, it may read the document to the user. Consequently, the HTML should focus on what the document means rather than on what it looks like. Most important, this style of authoring respects users’ preferences. A reader can choose the fonts and colors that suit her rather than relying on the page’s default. One size does not fit all. What is easily readable by a 30-year-old airline pilot with 20/20 vision may be illegible to an 85-year-old grandmother. A beautiful red and green design may be incomprehensible to a colorblind user. And a carefully arranged table layout may be a confusing mishmash of random words to a driver listening to a page on his cell phone while speeding down the Garden State Parkway. Thus, in HTML, you don’t say that “Why CSS” a few paragraphs up should be formatted in 11-point Arial bold, left-aligned. Instead, you say that it is an H3 header. At least you did, until Netscape came along and invented the font tag and a dozen other new presentational elements which people immediately began to use. 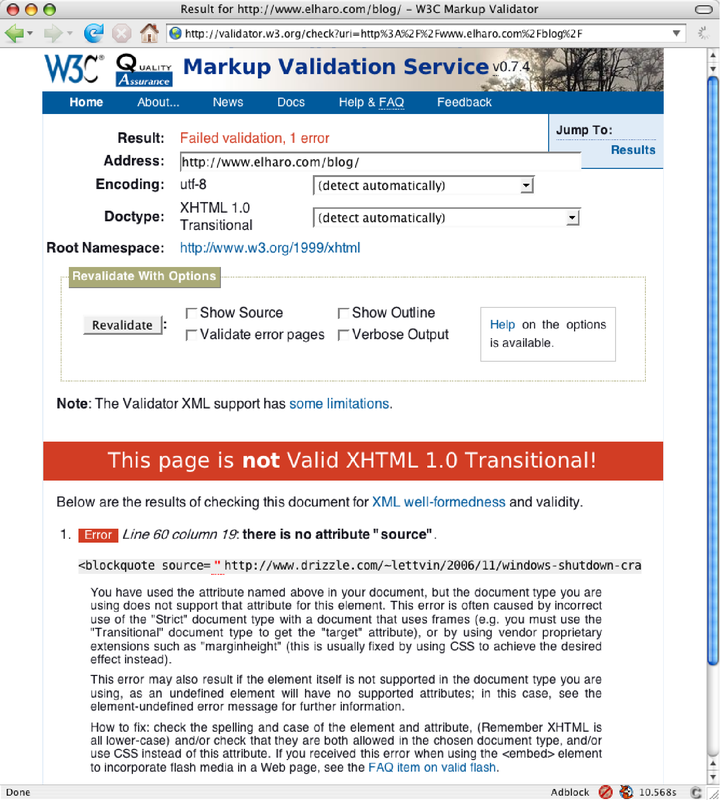 The W3C responded with CSS, but the damage had been done. Web pages everywhere were created with a confusing mix of font, frame, marquee, and other presentational elements. Semantic elements such as blockquote, table, img, and ul were subverted to support layout goals. To be honest, this never really worked all that well; but for a long time it was the best we had. That is no longer true. Today’s CSS enables not just the same, but better layouts and presentations than one can achieve using hacks such as frames, spacer GIFs, and text wrapped up inside images. The CSS layouts are not only prettier; they are leaner, more efficient, and more accessible. They cause pages to load faster and display better. With some effort, they can produce pages that work better in a wide variety of browsers on multiple platforms.